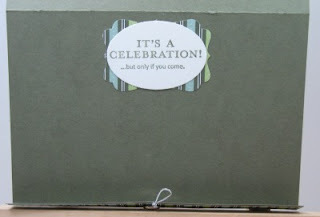 Challenge #5 for the Peachy Keen Let's Face it Fridays (LFIF) was to create a holiday party invitation using our PKS face stamps. I was thinking this would be the perfect time for a set of reindeer! Please visit the PKS Challenge site HERE to check out all of the other wonderful projects by the rest of the design team. If you have some PKS face stamps, you can play along on the challenge for a chance to win the Winter Frolic Cricut cartridge!!! Written instructions for this card are below the pictures. 2) Clip off the feet and horns on the owl pieces. Sponge the edges of all cocoa pieces with chocolate chip ink. For the horns, clip off the head and tail of the bat. Cut away some paper between each bat wing point to create the top of the horns. Cut in half to create 2 horns. 3) Glue a heart on each side of the head for ears. Glue horns onto back of head. Stamp the muzzle with the nose stamp from the Peachy Keen Tear Bear Face Parts (PK-139) stamp set. Stamp the eyes from the same set on each face. Add highlights to eyes and nose with uniball white gel pen. Attach muzzle with dimensional. Trim 1/2" red circle into an oval for Rudolph's nose and attach with dimensional. 4) Cut a small wedge out of each black circle to create hooves. Apply a little highlighting. 5) For card base, cut 8 1/2 x 5 1/2". Along the long side, score at 4" & 8". The 1/2" flap will keep the card closed. Add layers of choice onto card. 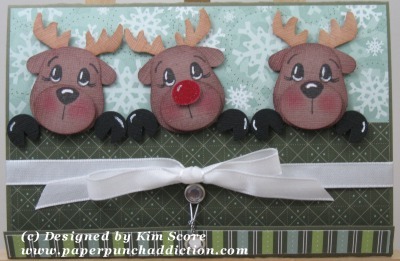 You could try a wood look paper to make it look like a wall where the reindeer are perched. To keep the card closed, I used the crop-a-dile to punch a hole in the center of the flap and attach a jewel brad. Then, punch hole in the lower center of the card front and attach another brade. Loop a piece of cording between the 2 brads. 6) Attach reindeer and hooves with dimensionals to front of card. Tie taffetta ribbon on front. WOW! This card is adorable and amazing, you did a fantastic job! I cant believe these are all punches WOW! how stinkin cute and creative! TFS and have a wonderful weekend. Kim, I love your little reindeer faces! Oh how sweet are those little tear bear faces!! I also love their hooves, they are so cute! Sweet Card!! So cute. I love those peeking reindeer. Fabulous job as always! Soooo cute! Love those peeking reindeers. TFS! That's so cute. Thanks for sharing. OMG KIm this is just adorable!!! I love the red nose reindeer and I really need to get those stamps now! Thanks for sharing....you're awesome!! Love these little reindeer faces Kim. So very cute! Cutest little reindeer ever! You are so creative, Thanks for sharing your wonderful creations with us! Oh, this is darling! TFS info.